A former Australian policeman is rescued by a tribe of children when he is banished from a desert town and sent into the desert to die by the desert town's evil queen. I just saw this -- after being blown away by Fury Road, I decided I was missing a lot and chose to watch all the previous movies. It's a strange film in some ways; when I learned that Miller had directed all the action sequences and Ogilvie had directed everything else, it made more sense. I was really disappointed in the way the "feral hero children" stuff was shot, it seemed straight out of Endor. Even the soundtrack was Ewok-evocative. But to my eyes the film made up for it with the awesome Bartertown / Thunderdome / action sequence stuff. You have to hand Miller this; even when he does something that doesn't really work, he is at least doing something new. It's not like he made the same movie over and over again. * Scroolose is basically a proto-War Boy. * Max rescues the idealists who are charging off into the desert and instead re-directs them to an outpost of quasi-civilization that already exists. * The wives' pleasure dome really, really, really looks like the Thunderdome. Well, it isn't so much redirection as "this is our only chance to survive". The kids are a bit hokey, but I love the way they talk, so all is forgiven. That music they play as were looking around Bartertown the first time? Sort of a percussive thing played on pots and pans? That's going to be going through my head next time I start a new contract and get shown around an office. Let's not forget the Riddley Walker shoutout/ripoff. Can't we just get BEYOND Thunderdome? I wonder of there was some kind if formal handover of the crown for "Most quotable Mad Max movie" from this one to the next one? The very ending was kinda a groaner. Heh. I like that bit a lot. 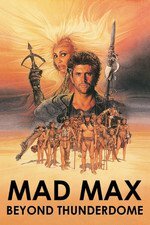 This was the first Mad Max I saw in a theater, mainly because I was a big Tina Turner fan at the time. I gather it gets highly mixed reviews from most, but I've always liked it. I guess the stuff with the kids is a tough sell for the Road Warrior fans who prefer to stick to the crazy action sequences. As a piece of post-apocalyptic myth, though, it's always worked well for me, especially as a contrast to Bartertown where "civilization" is a false front and "capitalist trade" is a rigged game meant to give the illusion of freedom. The casting of Tina Turner is something that only could have happened within a pretty short time frame. Like the casting of Coolio in Batman and Robin. I think I saw it once on the TV in the early 90s. I was obviously too influenced by the prevailing opinion, because (having just watched it again) this is an awesome movie. 1985 George Miller interview with Anne Billson about the film.